This 7 3/4" x 7 3/4" wide square clock hangs on the wall. Runs on one AA battery (not included). Design of clock hands may vary. 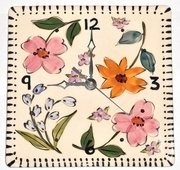 We offer anyone of our many other patterns to be put on this clock face for you. Just call (508)932-2574 or e-mail for assistance. 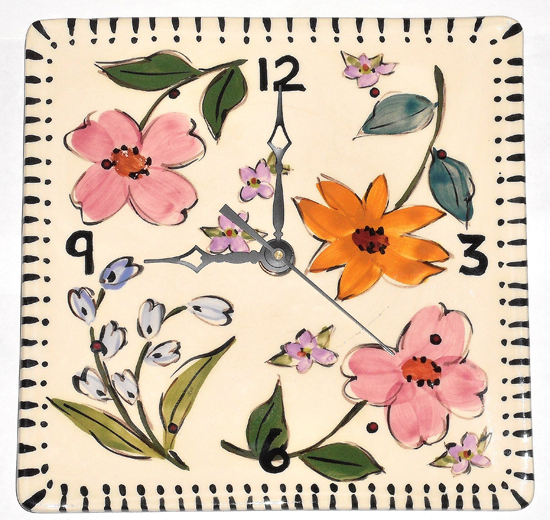 View our assortment of clocks. Be on the lookout for new arrivals. If there is a certain pattern of ours that you would like to see on a clock, just give us a call (508)932-2574, or e-mail us (drolldesigns2@yahoo.com) and we'd be glad to do that for you, at no extra charge. You have your chose of round, square, or rectangle.